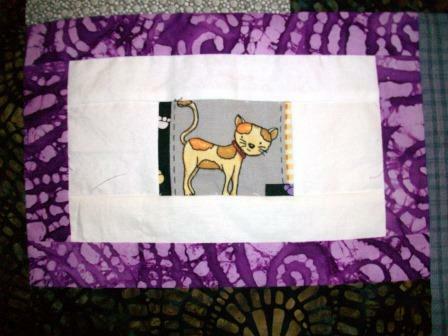 Still working on the Steps baby quilt which I have decided to name "Baby Steps." 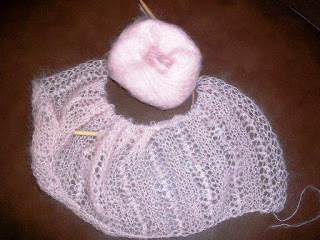 My current knitting project is a scarf/shawl using pattern Claire by Lynn Anne Banks. The yarn is Lana Gatto Silk Mohair in a pale pink. I've also started planning and piecing my next quilt. I'm using fabrics that a friend from Boston sent me mixed with left-over fabrics from past projects. 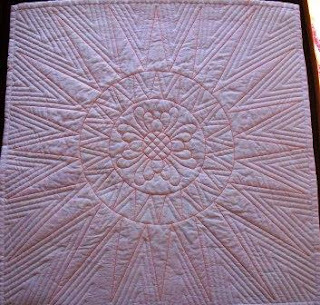 The center is a pillow panel from my friend. 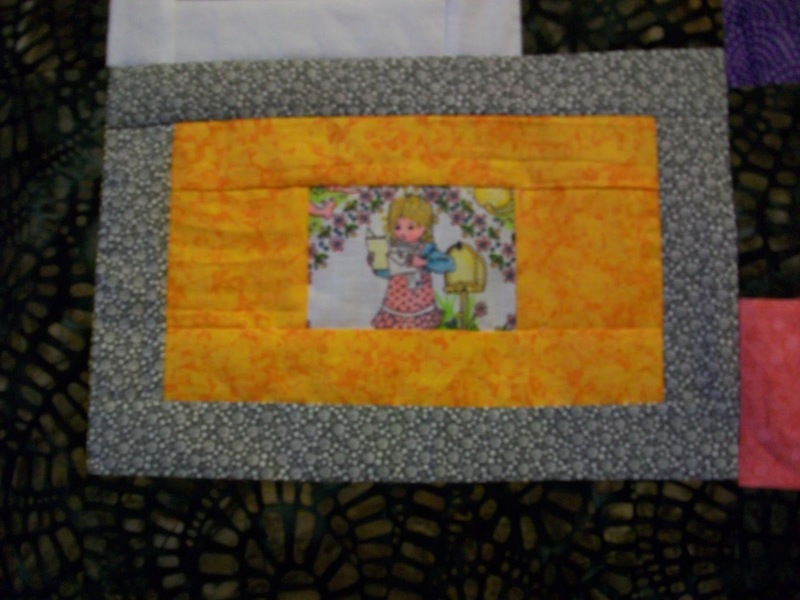 There were two of them, so there will be two similar quilts eventually. 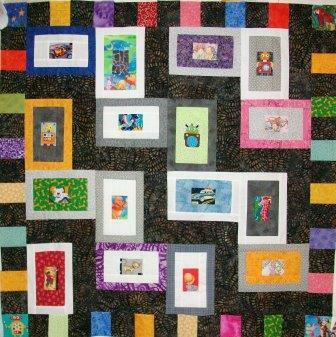 When finished the quilts will be donated the the Alzheimer's Quilt Study Group. 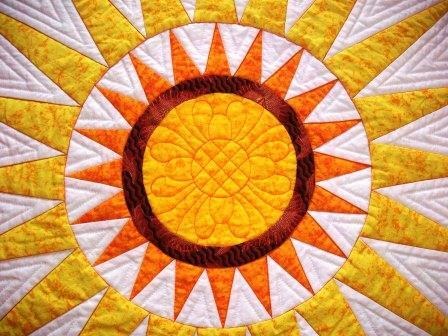 As you can (sort of ) see, the center "pillow" medallion is in the center of a sunshine and shadows quilt layout. 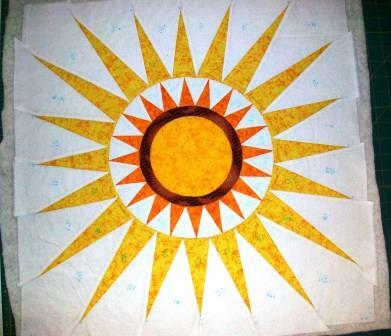 This quilt top will become a baby quilt for my yoga instructor. I've been going to free classes at the local library on Saturday mornings since November. She announced recently she and her family are adopting a baby due early June. This will be my way of "paying" her for the free lessons. 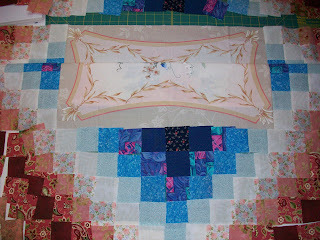 For this quilt top I used the step pattern from block lotto blog. The top is machine pieced. It measures 42 in square. Each block features something of interest -- a robot, a dog, a cat, a girl, etc. 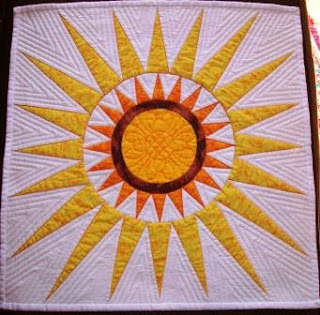 Now I have to do the quilting. 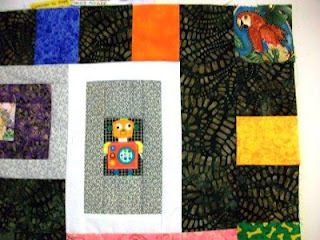 I finished my entry for the Quilt Alliance Twenty contest.and mailed it off. Here it is. It is hand pieced and machine quilted, measures 20 in square. 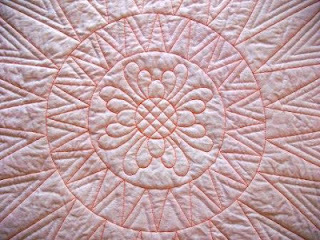 Here's a closer view to show the quilting in the center. The back before I added the sleeve and label. 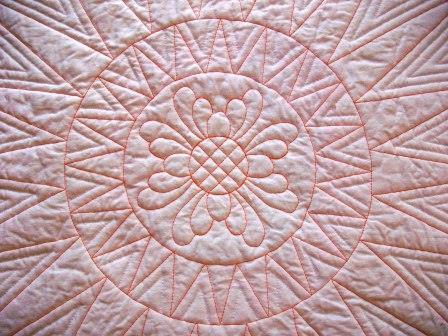 It is easier to see that I used orange thread to quilt some areas and white to quilt others. 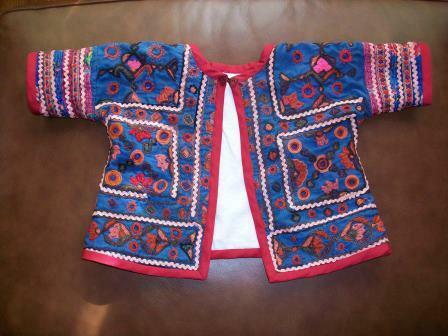 This baby jacket is for a friend's first grandbaby. The baby shower is this Sunday. 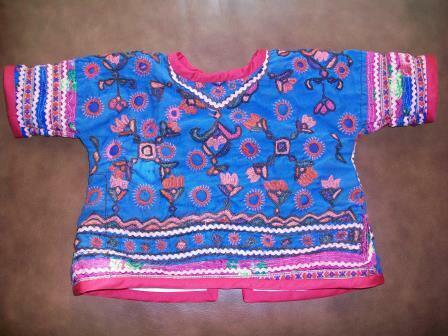 It is made using this garment with traditional embroidery from India that her daughter (the aunt-to-be) gave to me to use in a quilt or something. 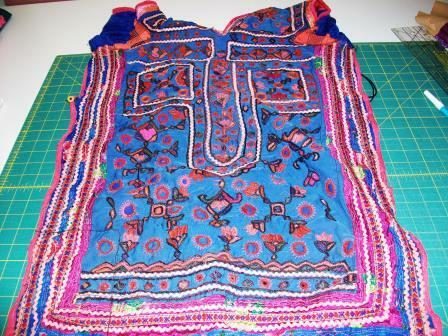 Here is the front and sides which would wrap towards the back laid out flat. And this is the back or as you see the inside of the garment (the back is really open). 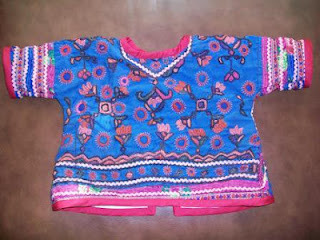 I folded the garment in half long-wise. Then using the Simplicity pattern 2900 I laid out the one pattern piece. The jacket is lined with white cotton flannel. 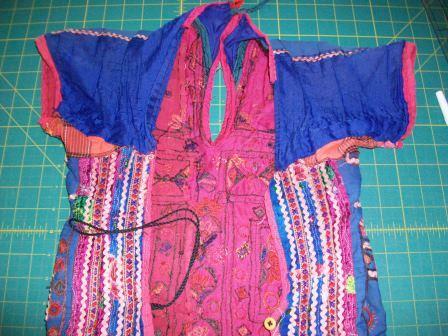 I used bias binding along the sleeves and around the jacket to add a “pop” back. Believe me it looks much better with the red binding than without it. Here is the back. I love how it turned out. I think the baby's mother and grandmother will like the jacket. This small quilt is for the Quilt Alliance Twenty contest. It is their 7th annual quilt contest. This year in honor of their 20th Anniversary they chose a broad theme that celebrates TWENTY: the numeral, the concept, the quantity, the word. I started by looking through my quilt books and found this one called Golden Splendor in Barbara Brackman’s Encyclopedia of Pieced Quilt Patterns. I drafted the above pattern out on freezer paper with 20 triangles in the circle area and minus the feathers on the outer star points. I wasn’t happy with the outer 8 points and changed them to 20 points. 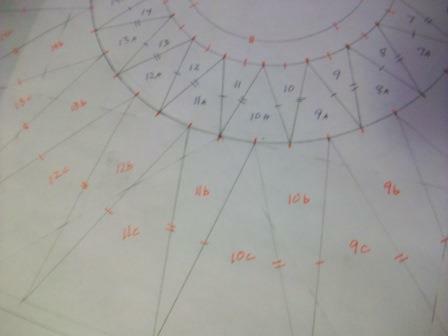 So my pattern now had 20 inner points/rays and 20 outer points/rays. Over the next week I played with laying out fabrics trying to decide on the color palette. I carefully numbered each piece prior to cutting them out. 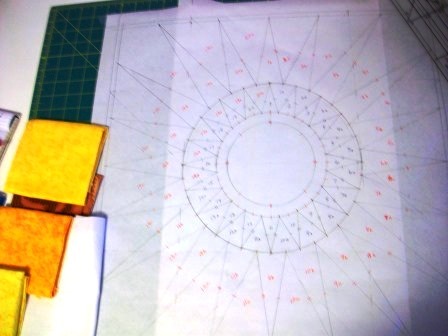 This small quilt I hand pieced to try to make sure the points were as sharp as possible. Here is the hand-pieced quilt top. 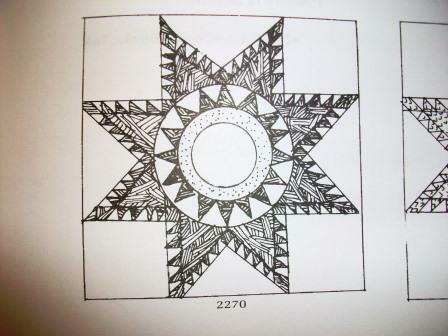 I plan to machine quilt it.